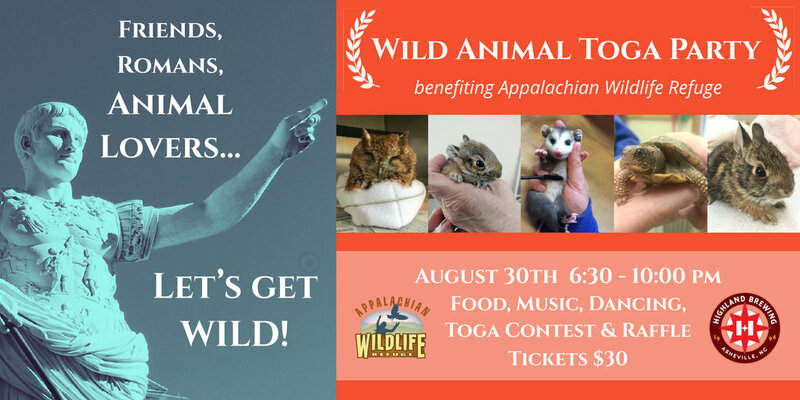 Join the fun at the Wild Animal Toga Party at Highland Brewing to raise funds that will help save wild lives! Enjoy delicious food, fun entertainment with music and dancing, as well as a raffle of amazing items. All are invited to join in the toga fun and enter the Wild Toga Contest. Visit with wild animal ambassadors to learn more about the work being done to help our native wildlife. There is a cash bar, but food and entertainment is included with the ticket price. Tickets are $30 each - limited number available! If you are not able to make the event or wish to provide additional support, please make a donation. Thank you! ​Is your costume ready to go? ​Snap a selfie or video, post on social media and share - be sure to tag Appalachian Wild. Thank you to our generous sponsors for your support! A toga party is a type of costume party with a Roman or Greek theme and in which male and female attendees are expected to wear a toga, or a semblance thereof, normally made from a bed sheet, and sandals. At toga parties, the costumes, party games and other entertainment often follow a Roman or Greek theme. Toga parties held by college or university students are associated with keg parties and excessive drinking. The earliest known college "toga parties" took place in the early 1950s. Toga parties are recorded, for example, in the yearbooks for Theta Delta Chi (1952) and the University of Michigan's Acacia fraternity (1953). Another early college student toga party took place in 1953, when Pomona College students wore togas and ivy wreaths, and brought their dorm mattresses to freshman Mark Neuman's home on Hillcrest Avenue in nearby Flintridge. For the eight decades before such Greek-themed parties became known as "toga parties" in the 1950s, similar parties, generally called "bed sheet and pillow slip" parties (or simply, "pillow slip" parties), in which attendees wrapped themselves in sheets and pillow cases, were regularly held by fraternal orders (like the Masons, Odd Fellows and Elks), civic organizations and church groups. In 1882, the Terpsichore Society of the Ohio State University held a "pillow slip party" which may arguably be considered the first-ever college "toga party". The Guinness World Record for the largest toga party is 3,700 participants. The event, organized by the University of Queensland Union and the Queensland University of Technology Student Guild, was held on 24 February 2012 at Riverstage in Brisbane, Queensland, Australia.